Louis Armstrong Stadium is going to exceed everyone's expectations. That was the message delivered by USTA Billie Jean King National Tennis Center Chief Operating Officer Danny Zausner at a media preview of the new stadium on Thursday. 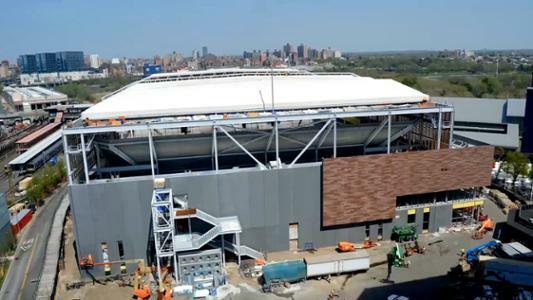 Members of the press were invited to the tennis center in Flushing, N.Y., to check in on the progress of the construction and to get a first-hand feel of what it will be like for players and fans. Reporters, news crews and photographers were invited to a presentation and tour of Louis Armstrong Stadium, the first public media event dedicated to the new arena. Writers got the chance to step inside the lower bowl to get a feeling of what the players will see and experience when they walk onto the court, and they visited the lower concourse and upper deck to see the stadium through the eyes of a fan. The 2018 US Open takes place Aug. 27-Sept. 9, with the US Open Qualifying Tournament and Fan Week scheduled to begin on Tuesday, Aug. 21. That means we are less than 100 days until fans will be visiting Flushing Meadows for the final Grand Slam of the year. Work on the new stadium will be completed within the next 10 weeks, according to Zausner, who was one of three people to speak with the media, alongside USTA President and Chairman of the Board Katrina Adams and Rossetti President and CEO Matt Rossetti, the lead architecture firm behind the design. The opening of Louis Armstrong Stadium will also bring to completion the five-year, $600 million strategic transformation of the tennis center. In total, around 85 percent of the grounds has been improved over the past five years, headlined by the addition of a retractable roof over Arthur Ashe Stadium and a new 8,125-seat Grandstand Stadium. The last piece of the puzzle is Louis Armstrong Stadium and that is nearing completion, too. The biggest of the construction cranes left the site more than six weeks ago. The steel framework of the stadium and retractable roof was in place months before that, and the pre-cast concrete seating bowls were installed earlier this spring. The fabric for the roof is currently being installed and should be completed within the next month. For this to happen, the roof will need to be shut manually; the first test of the electronic opening and closing mechanism is likely to take place in early July. There are now between 250 and 350 construction workers on site each day putting finishing touches to various elements of the stadium, both public-facing and behind-the-scenes. "The new 14,000-seat Armstrong with its built-in retractable roof gives the US Open a second stage that is second to none," Adams said. "[It allows] us to present a reliable and predictable schedule that will be unaltraed by weather. Now, with two stadiums with roofs, you know that if you've got a ticket to the US Open, you're going to see tennis regardless of the weather conditions." The physical structure of the stadium is now 95 percent complete, meaning teams of mechanics, electricians and plumbers can work throughout the concourses, concession areas and bathrooms that encompass the entire stadium. Simultaneously, crews are creating the new broadcast booths and commissary kitchens. Over the next 30 days, workers will continue installing the seats inside the stadium and the glass windows that will make up the front of the retail stores on the first floor of the building. Polo Ralph Lauren, Wilson, adidas and the US Open Collection will have a retail presence downstairs, while Amex will have a hospitality space on the second floor. It’s anticipated that each partner will begin arriving to start furnishing their space from the middle of June. The stadium was built on roughly the same footprint of the former Louis Armstrong and Grandstand courts. Visitors to the US Open will recall that the former Louis Armstrong Stadium was last used at the 2016 tournament and then demolished just days after the 2016 champions had been crowned. Last year, a temporary 8,000-seat stadium was erected next to the construction site while work on the new stadium was underway. That, too, is now gone, leaving just the new Louis Armstrong Stadium, which is set to be both a fan favorite and engineering marvel. It features 14,000 seats, almost 40 percent more than the 10,200 capacity of the previous stadium of the same name, as well as an innovative design to keep fans cool and dry. A total of 7,400 seats in the upper bowl will be general admission, with the other 6,600 seats in the lower bowl reserved for Louis Armstrong Stadium ticket holders. The stadium will have a retractable roof – the largest second stadium with a roof at the Grand Slam level – in addition to natural ventilation that encourages air flow throughout the entire stadium. Through its design, it will be the first naturally ventilated tennis stadium with a retractable roof in the world. The way it works is that thousands of angled, overlapping terra cotta panels have been installed on the north and south sides of the stadium. Think of them as giant, horizontal window blinds that block out part of the sun. These louvers, all 14,250 of them, which make up part of the wall of two sides of Louis Armstrong Stadium, act in much the same way. They keep driving rain and some direct sunlight out, while still allowing for fresh air to come through and ventilate the seating bowls. Even with the roof closed, fresh air will still circulate around both the upper and lower seating bowl. The roof will essentially act like an umbrella, providing protection from the rain but allowing free airflow underneath. "For us, the completion of the new Louis Armstrong Stadium also represents a crescendo of almost a decade of working together, master planning and design that transforms literally every inch of 42 acres of this campus into one of the greatest spectacles in the world of sports," Rossetti said. "It's amazing."